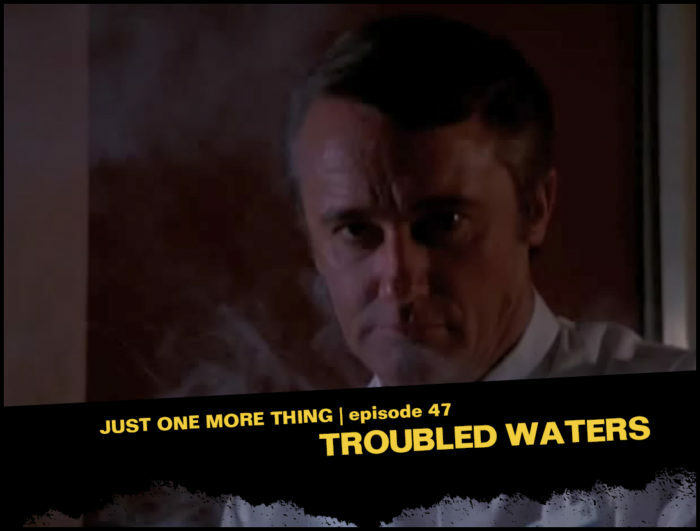 What was supposed to be a pleasure cruise to Mexico becomes a working vacation for Lt. Columbo in “Troubled Waters.” Also on board is used car kingpin Robert Vaughn, who kills the lounge singer who’s blackmailing him, while pinning the murder on her piano-playing ex. Though the crew is more than willing to buy the frame-up, Columbo can’t let it go, even on his vacation. Poor Mrs. Columbo. Back to travel the high seas of crime with Jon and RJ is comedian Richard Massara. A great 70’s episode to end the year on. Happy new year everyone!! Great episode guys. I really liked how Columbo wanted to get a warrant, but the captain played the law of the seas card. Apparently that is a real thing. This episode is also filled with Columbo repeat offenders. I can’t think of one where of the Columbo stock company partipated. Pity they couldn’t have shoehorned Vito Scotti. Cracking episode, cracking podcast. Cracking guest, too. Totally agree with your collective summations. One thing you missed though: is this the definitive ‘there IS a Mrs Columbo’ episode? For my money, it is (the closing scene alone, as well as the reason that they’re on the cruise). Thing is…which actress – either now or then – do you imagine Mrs Columbo to look like? Not sure who I would have cast as Mrs Columbo. But I always found Kate Mulgrew to be an odd choice. Seemed more like Columbo’s daughter than his wife. Can’t speak for the 70’s – I was too young then, so not knowledgable enough – but now, for a reboot, I’d go for…Monica Belluci. Works on a whole bunch of levels – if it was done right. My Mrs. Columbo is Margo Martindale. I heartily agree: this is the episode that conclusively establishes Mrs. Columbo’s existence (and is again codified in “Rest in Peace, Mrs. Columbo”). Despite all the dinner parties/Restaurant Writers’ Association awards ceremonies/vacations in which she failed to appear, I always believed she wasn’t merely Columbo’s imaginary spouse and I’m glad this episode validates my convictions. Nice work, everyone. I predicted that there would be some commentary on the longest performance of “Volare” in the history of the world, and the nurse chain-smoking in sick bay, and you didn’t let me down. I really enjoyed the ’70s vibe of the episode, especially Vaughn’s wardrobe and Stockwell’s ridiculous hairstyle and gigantic bushy eyebrows, which even drew commentary from Columbo himself. Suave! Goddamn, he’s not one suave fucker in this episode. Oh, and I also liked the brief mention of the name of the actress who played the victim: Poupée Bocar. “Poupée” is an unexceptional word in French; it just means “doll.” But English speakers can’t say it without giggling. Hey guys, long time listener first time caller. Speaking of boats, still awaiting your expert opinions on Last Salute for the Commodore! Night and day difference between this episode and that one. Have survived four 10-hour solo car trips staying awake by binge listening to your podcasts.